Local Real Estate executive Larry Lupone and Cafe aficionado Greg Munroe wanted to launch a totally unique eating establishment where Guilford locals and tourists could enjoy gourmet food, premium coffee and frozen yogurt in a relaxed, spacious and comforting environment. They came to Walden Pond Design with a concept and an opening date; we gave them an identity and then helped launch Colors Cafe. From the get-go, Colors Cafe wanted a brand identity consistent with the level of quality and uniqueness that their establishment would represent. Given their high-profile location on the Guilford Green, they wanted to launch with impact, flair and set the stage for continuity. They also wanted to harness the efficiencies of local, social and content marketing. Initially, we were all concerned that Colors Cafe not get lost in the “oh, another frozen yogurt place” shuffle; it was important that their brand identity appeal to a more sophisticated customer. Additionally, the owners wanted to leverage their deep ties to the Guilford community as well as communicate the quality and uniqueness of their cafe offering and space. With a name like Colors Cafe, the use of polychromatic imagery in the logo was a no-brainer. Care had to be taken, however, to avoid pastel or juvenile colors stereotypical to the froyo space. To do this, we married a more earth-tone color bar with a workmark consisting of block and cursive fonts. We utilized a multi-channel approach to launch Colors Cafe: traditional print media for awareness, direct response to generate trial and traffic and social media to create deeper connections and an ongoing communications channel. Given the local and newsworthy nature of the launch, we developed half-page print ads communicating the essence of Colors Cafe in the context of it’s location: bringing some local color to the Guilford Green. 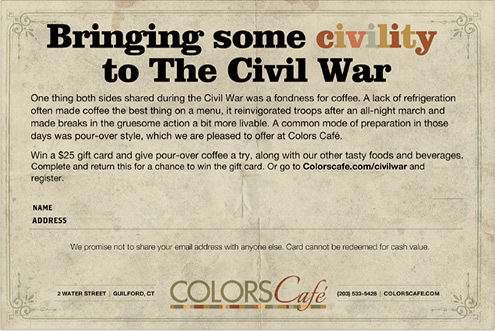 Our direct mail invited residents of Guilford and Madison to bring a friend to Colors Cafe to share a “cup of color”: coffee, tea or froyo. For launch, we also rolled out colorscafe.com – the digital hub for Colors Cafe marketing efforts. And finally, given the social nature of Colors Cafe positioning, we leaned heavily into social media to grow loyalty and engagement, as well as setting the stage for an ongoing communications channel. 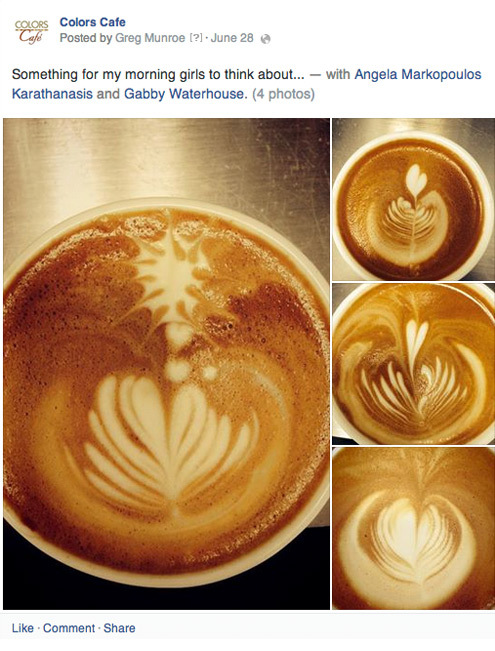 Two events coinciding with the launch of Colors Cafe have proven to be fortuitous. First, as part of the town of Guilford’s 375th anniversary, a Civil War re-enactment was held on the nearby Guilford Green. 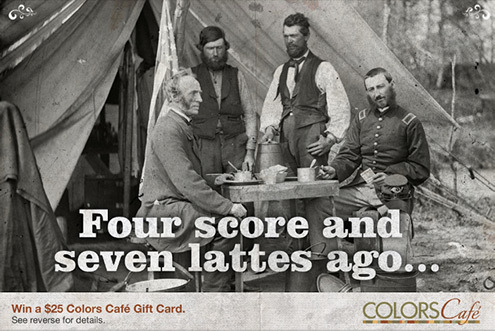 Colors Cafe was the official coffee vendor and we created a promotion focused on the role of coffee in The Civil War. Second was the FIFA World Cup. 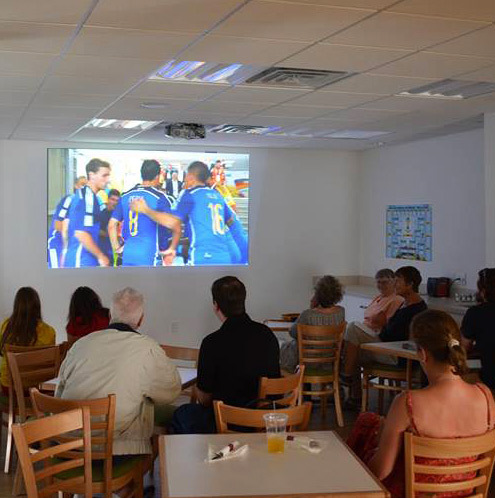 Colors Cafe have three large-screen video monitors; two situated in the Whitfield Room. We created a promotion for Team USA games where the Colors Cafe kitchen team would create custom menus for USA game days, as well as Frozen Yogurt discounting based upon Team USA’s performance. 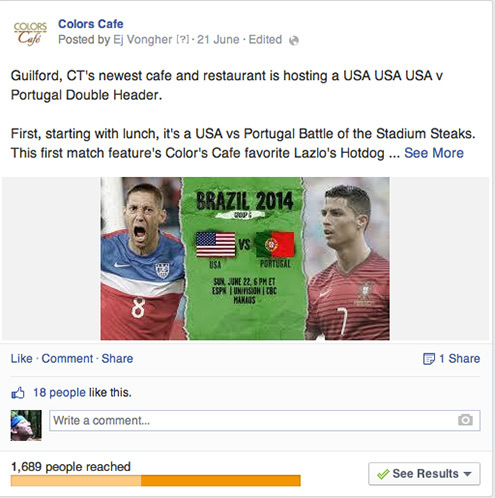 We communicated this promotion via low cost social media promotions targeting local fans of World Cup football. Reaction to the promotion has been significant. After a month of awareness-producing advertising activity, our efforts shifted into a lower-cost sustain phase. 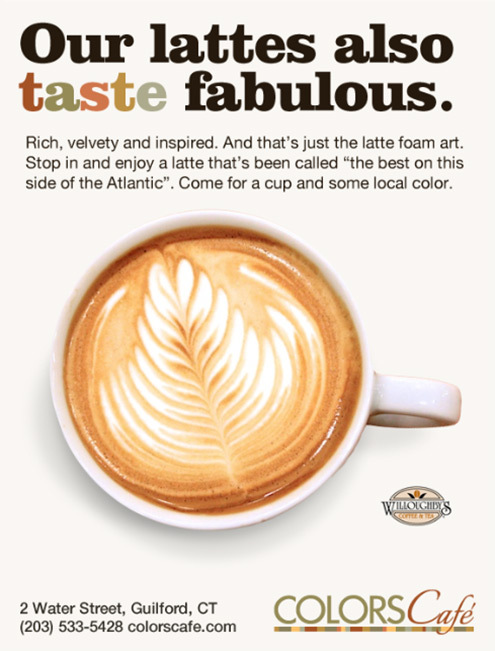 Centered around small-space ads and social media posts which celebrate hero products (Lattes, Desserts, Smoothies), the sustain phase will maintain Colors Cafe’s growing awareness and positive predisposition among Shoreline residents. Colors Cafe has launched “with a bang”. It’s one of the most talked-about cafe destinations in Guilford and during most lunch periods, to quote Greg Munroe, ‘we are slammed’. While it’s too early for any significant empirical analysis, it is noteworthy that in a month, Colors Cafe Facebook Likes have grown to near those of long-established local competitors such as Cilantro and Cafe G in Branford. “We contacted Walden Pond Design for a logo, initially. What we got was a fully-integrated communications program that touched all aspects of our business in as creative and exciting a manner as we could have hoped for. Hiring Andrew and EJ was such a great move,” said Colors Cafe owner Greg Munroe. “Andrew and EJ are that unique breed of communications professionals who never stop coming up with ideas. We’ve probably only executed 10% of the thoughts they brought to the table and we couldn’t be happier. Thanks to Walden Pond Design, Colors Cafe launched with the image and impact we needed to be a real player in this space,” said Colors Cafe owner Larry Lupone.